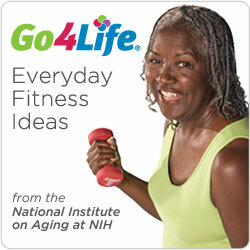 On Wednesday, October 19, 2011, the National Institute on Aging (NIA) at NIH will participate in a briefing on Capitol Hill about aging and exercise, at which Go4Life, the exciting new national exercise and physical activity campaign will be introduced. Go4Life is designed to help people 50+ fit exercise and physical activity into their daily lives. Hosted by Senator Herb Kohl of Wisconsin, Chair of the Senate Special Committee on Aging, and Senator Mark Udall of Colorado, a member of the Aging Committee, the event will begin at 1:30 p.m. in Room 216 of the Hart Senate Office Building, at Constitution Avenue between 1st and 2nd Streets NE in Washington, DC. The agenda will feature an overview of research on the health benefits of exercise and physical activity for older adults, as well as a description of the Go4Life campaign, a discussion of the vital role of participating organizations in promoting exercise and physical activity at the community level, and a demonstration of sample exercises. The program will recognize Go4Life’s initial private, nonprofit, and Federal government partners and team members who are so essential for the success of this effort in communities across the U.S. Please let Karen Pocinki, NIA Go4Life campaign director, know by October 12 if you are able to come, at [email protected] or 301-496-1752. We look forward to seeing you on October 19th!